For centuries the Gadhimai festival in Nepal has seen temple grounds awash with the blood of animals slaughtered in the name of 'tradition'. And it stopped — today. The Gadhimai Temple Trust hereby declares our formal decision to end animal sacrifice. With your help, we can ensure Gadhimai 2019 is free from bloodshed. Moreover, we can ensure Gadhimai 2019 is a momentous celebration of life ... For every life taken, our heart is heavy. The time has come to transform an old tradition. Hundreds of thousands of water buffalo, goats, chickens and other animals will now be saved from a brutal death by bludgeoning or decapitation. This achievement is no small feat. 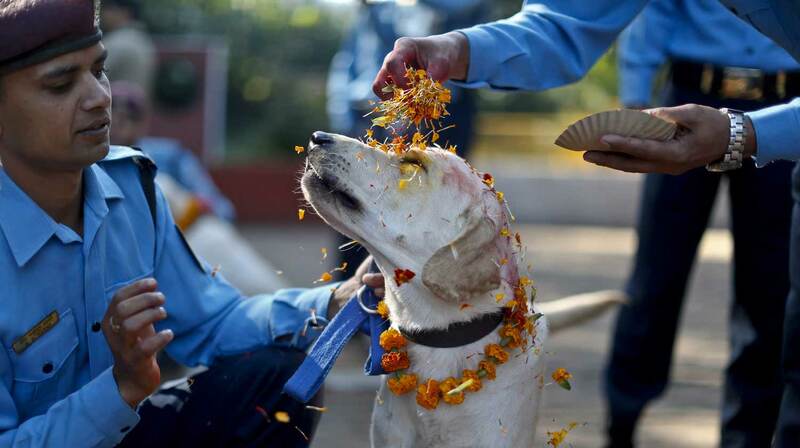 We take our hats off to the extraordinary efforts of the Humane Society International/India, Animal Welfare Network Nepal, and countless animal protection groups and individuals around the world who have helped inspire this victory of kindess over cruelty. The hard work is not over yet — with the big task still ahead of educating devotees of this significant change in the years leading up to the next festival. And, of course, greatest credit must go to the members of The Gadhimai Temple Trust itself, who recognised that the power to change the trajectory of our common humanity is in our hands. The incredible news exploded on social media, where a long running campaign has been waged on behalf of the victims of the festival. It is yet another signpost that the pathway our species is paving for itself is slowly but surely bending towards a more compassionate future, championed by caring people in every country of the world. That is to say, we are getting kinder. Worldwide, never before has there been such a rate of positive change — in public policy; in commerce; in public awareness and advocacy. And never before have the animals of this world needed it so much. We have, after all, inherited an age where the majority of animals in human ‘care' are valued not as living, thinking beings, but as commodities — spending their entire lives confined in factory farms. Nothing short of a profound global shift in thought is needed to awaken our shared responsibility toward our fellow species and break this global cycle of suffering. Could the previously un-thought of Gadhimai 'celebration of life' festival be a sign that a kinder world is possible? In a moment that has touched the hearts of millions worldwide, a 3 year old Nepalese boy saves a 'sacrificial goat' from slaughter. When kind people seek to transform cruel traditions, they don't risk losing their identity. They strengthen it by demonstrating that culture cannot be measured by the repetition of practices frozen in time by values of the past. For this, the tradition of the Gadhimai festival will become all the stronger. It takes compassion and courage to rise above cruelty and recognise that the ways of doing things we inherit from the past do not define us; to recognise that those we share this world with also share our desire to avoid suffering. Whether in our temples, or in our homes, we can all choose to live without killing. Compassion is fundamental to all human cultures — and when it shines through, traditions steeped in cruelty can be transformed. On scales grand and small, if we want to live in a kinder world, we all have a role to play. And if the world's largest animal sacrifice event can be transformed into a 'celebration of life', then there is reason to be infinitely hopeful about the future.